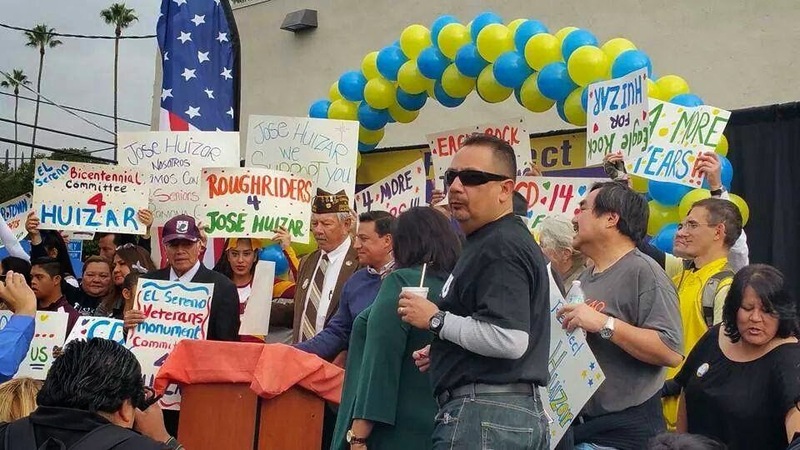 In Part Two of our Mayor Sam Exclusive, we disclose the documentation detailing CD 14 Councilman Huizar's General City Purposes Funding to Community Organizations from 2008-to the Present. How much "Patronage Love" has been given recently to the organizations represented at Councilman Huizar's Campaign Kickoff? Who much Public Money was spent to provide for this 2015 "Rent-a Crowd?" 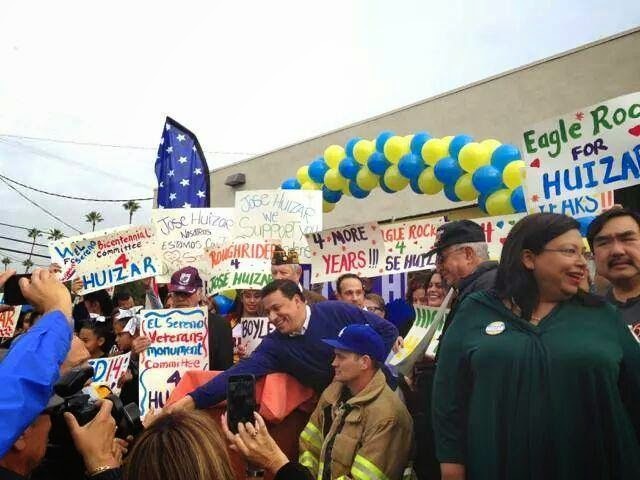 ** Blogger's Note: In Part Two of our Mayor Sam Exclusive, we go where CD 14 Councilman Jose Huizar has never gone before. In the years that this blog has reported on the CD 14 CLARTS Fund, the self-noting Princeton Graduate has not made available to his constituents how he chooses to dispense of his Discretionary Funds, or for that matter, a formal process of applying for funding. 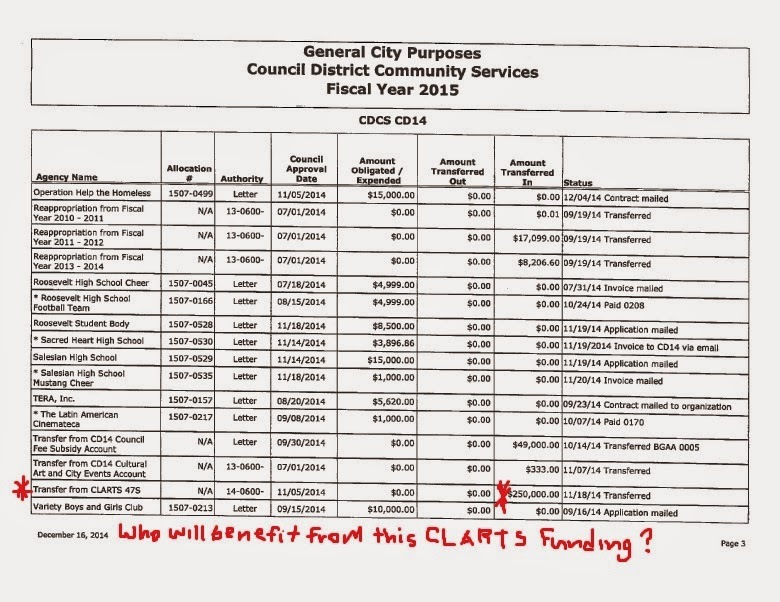 For exemple, you can link here to CD 8 City Councilman Bernard Parks Webpage to view the most recent report from the City Clerk's Report on the City Council's expenditures of General City Purposes Fund ......., but in CD 14, the absence of not being open and transparent with those details lead to comments such as this from 2009. Huizy's been gutting the CLARTS fund, $50,000 at a time for years (look up "CLARTS" in the council file database, if you doubt - and see hundreds of thousands wisked away); transferring the $$ into his general purposes cache for pretty much anything he and staff want to use it for, and without any further accountability. They plead poverty, budget cutbacks, reduced discretionary funds -- IF your not one of his supporters, but for the others, there's a handy slush fund they can tap into anytime they wish. You can bet there's nothing left in a fund that was projected at times to produce a half-million each year, and since the specific expenditures were actually FROM his general purposes, the only "trail" will be those $50,000 at a time "for district amenities" transfers. Here's one vague transfer from just a few months ago, there are MANY, many more in the files. to assist local neighborhood programs services and needs in each Council District. Fourteen. This effort is of special benefit for the residents of the City and for CD-14 and deserves financial assistance from the City. item in the GCP portion of the 2008-2009 budget for this purpose. I THEREFORE MOVE that $50,000 in the Central Los Angeles Recycling and Transfer Station (CLARTS) Community Amenities Trust Fund No. 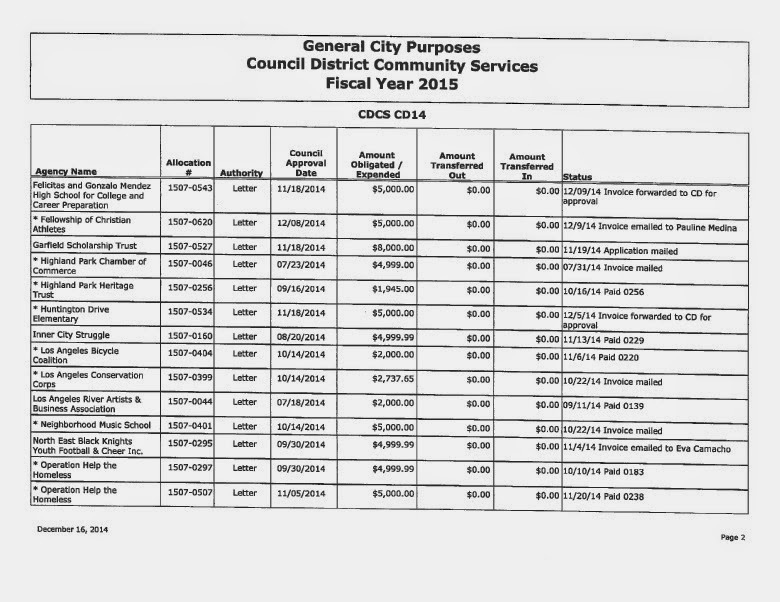 47S, Department 14, be transferred to the General City Purposes Fund No. 100-56, Account No. 0714 (CD 14 Community Services) to provide funding for community amenities in Council District Fourteen. ** 2008-2009 City Clerk's General City Purposes Fund Allocation Report (CD 14 Section Page 86-92). 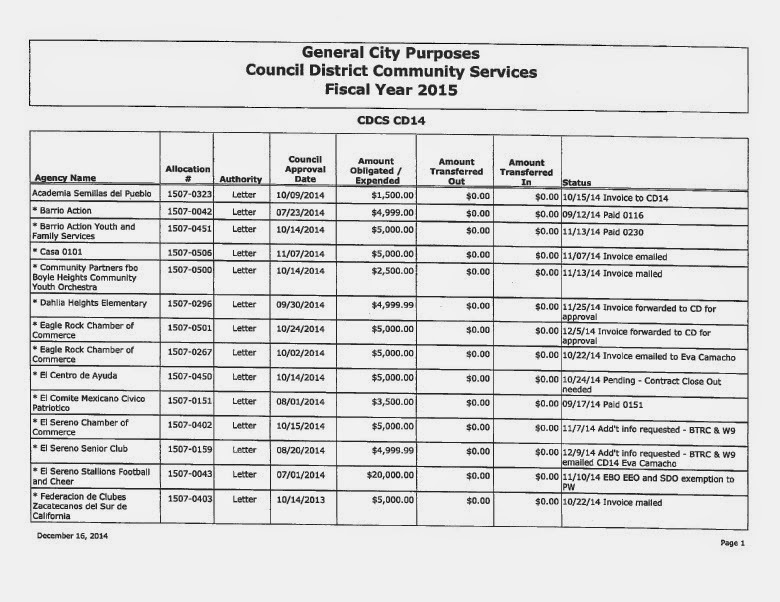 ** 2009-2010 City Clerk's General City Purposes Fund Allocation Report (CD 14 Section Page 79-84). ** 2010-2011 City Clerk's General City Purposes Fund Allocation Report (CD 14 Section Page 86-91). 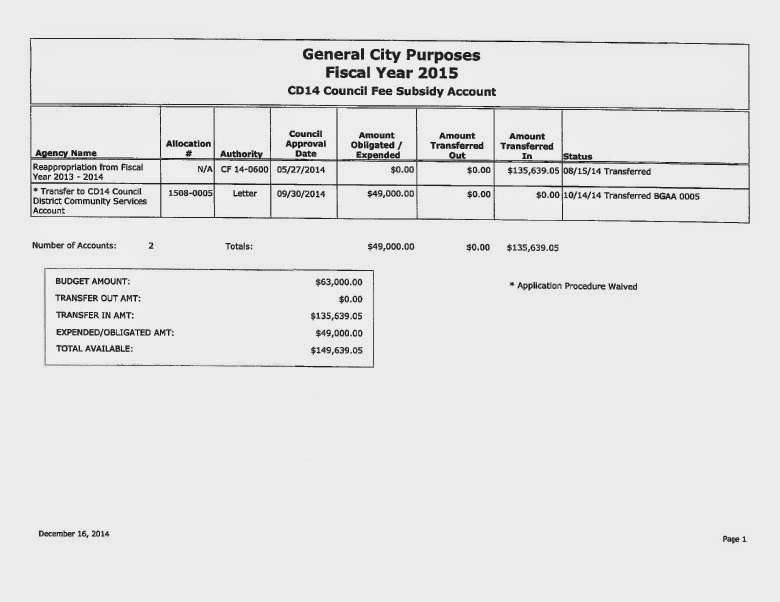 ** 2011-2012 City Clerk's General City Purposes Fund Allocation Report (CD 14 Section Page 101-105). ** 2012-2013 City Clerk's General City Purposes Fund Allocation Report (CD 14 Section Page 100-105). ** The 2014 Forms can be review by linking to our "Light Up the Huizar Christmas Tree Post". ........, and the most recent 2015 CD 14 General "Council Patronage" Fund Reports are posted below for your review. Page 1 of 2015 CD 14 GCP Allocation Report. Note the $20,000 given to the El Sereno Stallions Football & Cheer Program (given them a total of $31,000 since 2014). Page 2 of 2015 CD 14 GCP Allocation Report. Page 3 of 2015 CD 14 GCP Allocation Report. 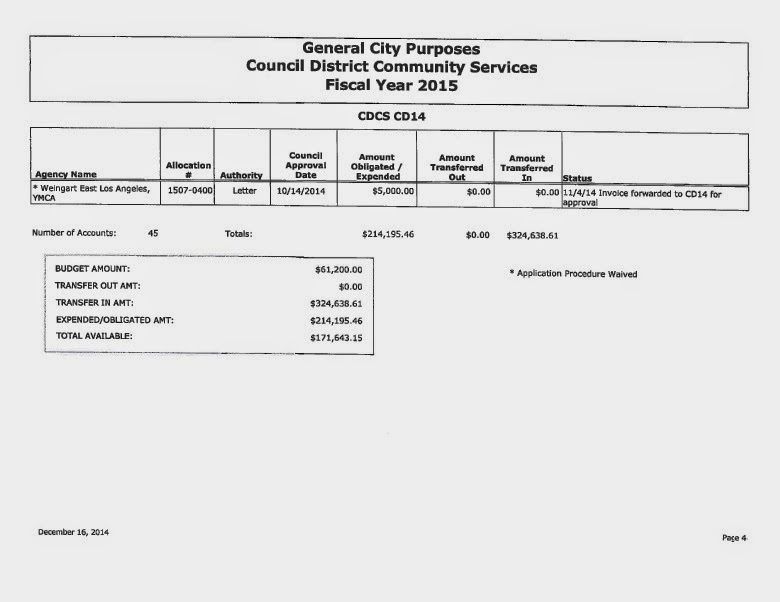 Note the BIG transfer of $250,000 into the CD 14 GCP Account by Councilman Huizar. Page 4 of the 2015 CD 14 GCP Allocation Report. Page 5 of the 2015 CD 14 GCP Allocation Report. ** In Part Three of our Mayor Sam Exclusive, we will detail funding information from the Real Property and Pipeline Trust Funds. Just another Dot connected as to why Tammy M left the LA#@. She is part of the money laundering on how to buy an election. She is in business keeping folks in poverty. Are we going to get the same level of detail on the millions that Supervisor Molina received every year while she was on the County Board of Supervisors? I appreciate having this information, but it is meaningless if we have no comparison with what the challengers have done. Just now reading post. Not sure of the $$ you are referring to here, but if valid, lets have Ms Molina provide an answer. Fair?